Christa stayed the night in Joe’s room, sitting in the chair and watching him sleep. She wanted to be there first thing in the morning when he woke up. As she sat in the chair, she dozed in and out of sleep, and the memory of that tragic day began to drift in and out of her dreams. Her head knodded, startling Christa out of her sleep. The dream…it was so real…just as if it had happened yesterday. Thirty-six years had already passed. She thanked God every day that Joe didn’t get hurt that day, too. But now he was hurting in a different way. Christa knew that things had been rough for Joe lately. But his psychiatrist attributed Joe’s depression to that tragic day, saying that somehow Joe felt responsible for Teresa’s accident and had carried this guilt with him all these years. Christa didn’t believe this. She and her husband never blamed Joe for what happened. After all, he was only four. It was an accident; there was nothing Joe could have done to prevent it. The family rarely spoke of that day, and neither did Joe. Christa was certain that it was a more recent turn of events in Joe’s life that had brought him to this state of depression. Publisher’s Note: The names and places have been changed to protect those involved. While the story is based on true events, parts of the story have been fictionalized. Christa could tell that Joe did not recognize her. Tears came to her eyes. Her son sat there like a vegetable. The nurse looked at Christa sympathetically and told her that this can sometimes happen after treatment. The nurse reassured her that it wasn’t uncommon to have short term memory loss, and usually most of the memory would come back within a day or two. How could he not recognize his own mother? How could that be, Christa wondered. Nonetheless, she trusted what the nurse had told her. This was, after all, the only option for helping Joe. Joe had become so despondent in recent weeks. He wasn’t eating, wasn’t sleeping, his life had become, in his words, hopeless. There were so many things that could have contributed to his feeling this way. His family finally took him to a psychologist at the county clinic, and living close to the Mayo Clinic, he immediately referred Joe there for treatment. “There’s no where in the world that he can get better care,” the psychologist had said. “Shock treatments?” Christa was astounded. She remembered watching One Flew Over the Cuckoo’s Nest and was mortified! They wanted to do this to her son? “What about medication? Aren’t there…I don’t know what you call them…some type of pills for depression?” Christa wondered. They had no choice. This was the best option. They loved Joe, and they hated seeing how he had become. So sad, so lonely, so depressed. So, they agreed. Ten shock treatments within a period of two weeks. He would have to be hospitalized during the course of the treatments at Mayo Clinic’s psychiatric unit. “Welcome back. How are you feeling?” the nurse asked. The man stared straight up from his hospital bed at the white ceiling without so much as a blink from his eyes. His 6-foot 7-inch, 270-pound body did not move. He showed no emotion. He heard nothing. The nurse put one end of the straw in the glass of water and put the other end by his mouth, but he didn’t open his mouth to drink any of the water. He just stared straight ahead. Seeing that he was unresponsive, the nurse said, “OK, then, you just let me know if you need anything. I’ll be back in about 10 minutes to take you to your room.” Most patients reacted this way after treatment, this wasn’t unusual. The patient would regain his senses within a couple of hours, she thought. The man sat in the bed. He had no thoughts. He didn’t know who he was or where he was. He had no concept of time. After about 10 minutes, the nurse came with a wheelchair to take the man from the recovery room to his hospital room where he would stay for the next two weeks. He couldn’t move. He didn’t know how to get himself from the bed to the wheelchair. The nurse needed to call four orderlies to help lift him from his bed into the wheelchair. “There we go,” the nurse said with a sigh of relief. “Now, we’re going to go for a little ride to your room. And…you have someone waiting there to see you!” The nurse spoke to him as if he was a little child. But he didn’t know, because what he heard, he didn’t understand. For the first time, he moved on his own, turning his head and looking at the woman, but he did not recognize her. Joey and Tessie had been playing outside most of this early June day. Living on a farm, they always found something to do, and today was no exception. Not only was it starting to get late, but their play had taken them to the apple orchard at the far end of the yard. Joey knew they were not supposed to be playing this far away from the house. “I want an awpul. Just one? Climb this.” Tessie pointed to a grain elevator that was hoisted just high enough to reach to the top of one of the apple trees. Joey looked at it carefully. It was like a huge staircase. He had seen his dad use it last fall. 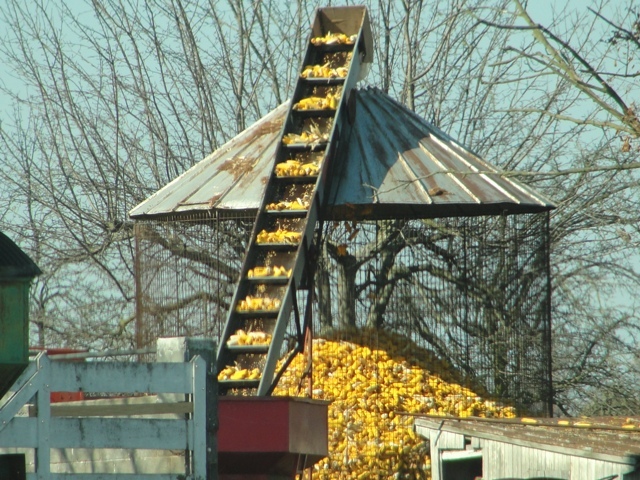 The big steps moved up, carrying the corn up to the top and dropping it into the corn bin. The steps weren’t moving now, and it was positioned perfectly so that Joey could climb up the steps to get to one of the apple trees. Joey climbed up the grain elevator very carefully. He still was small enough that his weight allowed the elevator to remain in an upright position, perfect for getting to the apples on the tree. What Joey didn’t know is that there wouldn’t be apples on the tree until Fall. “Did you get one? Did you get one?” asked Tessie anxiously. Joey looked carefully, but he didn’t see any apples. “Tess, there ain’t no apples on this tree,” as he lifted some of the branches and peered through the leaves of the tree. “Yes, there is!” Tessie stated emphatically, and she began to climb up the elevator herself. “Nope, no apples.” Convinced that he had done what he could to try and get his little sister an apple, Joey carefully turned around to go back down the big steps. He saw Tessie coming towards him. Tessie edged closer to the top and was now within arm’s reach of her older brother. Joey shoved his sister in an effort to get her to go back down the elevator. Not realizing his own strength, Joey’s shove caused Tessie to fall backwards and tumble over the edge of the grain elevator. Her jacket somehow got caught on the side of the elevator, and she spun around, hitting her head on the crank shaft. She fell to the ground, blood gushing out of her forehead. In light of the Minnesota Vikings getting crushed by the Chicago Bears last night 10 to 39, did you know that Joe played football at Soldier Field? Just one of the many interesting things that I discovered as I began my search into Joe’s life and who he was. His football team was just as bad, actually probably worse, as the Vikings are this year. What team and when did he play? More to come…. Nestled in the rolling hills of the midwest United States is the tiny town of Elmore. Elmore is surrounded by over 450,000 acres of farm land. Back in 1957, on one of those farms, a young couple was just starting out…working hard milking cows, feeding the pigs, raising chickens and farming the land. They had two children, a boy and a girl, ages 4 and 3, and one on the way. It was a time when children didn’t need to wear helmets when they were riding their bikes, carseats weren’t invented, and kids ran freely, using their imaginations and playing made-up games. Mothers were busy, tending to the household chores and working alongside their husbands in helping with the farm work. There simply wasn’t time to keep tabs on the children. It was on this farm, on a beautiful Spring day, when tragedy struck, and the 4-year-old boy stood helplessly as his 3-year-old sister fell, hit her head and appeared to be dead. Quite the opposite of what I and everyone else I shared the story with thought, the Mayo Clinic refers to electroconvulsive therapy (ECT) as the “gold standard therapy for severe depression.” Its website says that it is “a safe and effective treatment for severe and prolonged depression.” Check out the video on their website which seems to promise a solution to a lovely, peaceful life without reoccurring bouts of depression. Joe had suffered from severe depression and in 1994 had undergone electroconvulsive therapy (ECT)– approximately 10 treatments in a period of 2 weeks–through the Mayo Clinic in Rochester, MN. It was unfathomable to me that shock treatments were still a form of treatment for depression. Who hasn’t seen or read One Flew Over the Cuckoo’s Nest and thought that it was a cruel and barbaric form of treatment? And, especially the Mayo Clinic–isn’t that the world leader in health care? Cutting edge? How could one of the world’s best medical centers still be doing shock treatments? After my initial introduction to Joe, he started becoming a permanent fixture at most family gatherings–Thanksgiving, Christmas, Easter, weddings, baptisms, reunions. Every time I went to a family function, there he was. I remember the first Thanksgiving I hosted for my family. My brother asked me if it was OK if Joe came. “Sure,” I said, secretly wanting to ask, “Why?” I just couldn’t understand the relationship. I knew he was a friend of my niece (the bride’s sister), but it appeared that was all…just a friend, not a boyfriend or romantic interest of any kind. And, in my family (as in most), if people don’t talk about it, you just don’t ask. It was that first Thanksgiving that I realized preparing the normal amount of food was not going to be enough if Joe was there. 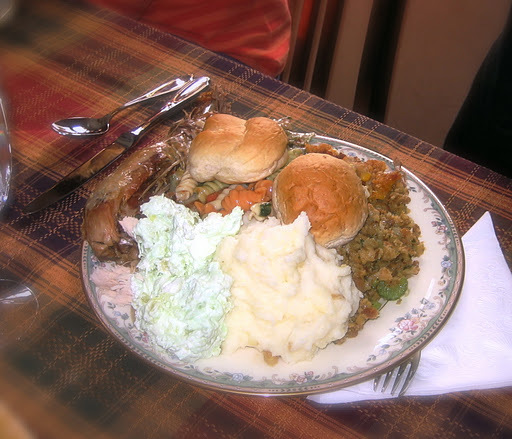 At least five helpings of food–here’s helping #1, and all subsequent helpings were just as large! And, of course, Joe had his straw–never left home without it! I’m not sure of the exact date that I first met Joe. I think it was at my niece’s wedding, which would have been in September of 1995. All I know is that when I first saw him, I was struck by how big he was–at least 6′ 7″ and probably about 260 pounds. He had a striking resemblance to Kris Kristofferson. I asked him if people told him he looked like Kris Kristofferson, and he said, “Who?” Never mind, I thought, a lot of people don’t know who Kris Kristofferson is–I only adored him from his big movie with Barbra Streisand, A Star is Born. Regardless, this man put away food like I’ve never seen. At least probably 3 huge plates full of food. And, he carried a straw in the inside pocket of his suit coat. He used it whenever he drank his water, his pop, and not so sure if I saw him have a beer or not, but if he did, he would have been drinking it with a straw. He told me that if he didn’t use a straw, the liquid would drool down the side of his mouth. He said he never left home without one. Why did liquids drool down the side of his mouth, I wondered. He seemed to eat just fine. I felt I didn’t know him well enough to ask, so I just left it at that. Nice to meet you, Joe….